A new six-part series looks at what goes on in the airport during its 30th year. THE APPARITION AT Knock helped usher in major changes for the small Irish rural town – and eventually paved the way for the introduction of an airport 30 years ago. The opening of the airport provided a new route for people into the west of Ireland – and a direct route for those who wanted to see the site of the famous apparition. Now a new six-part documentary, set to begin tomorrow on UTV Ireland, goes behind the scenes at Knock Airport, the little airport that could. The airport was the brainchild of Monsignor James Horan and today it serves 23 destinations across the UK, Europe and the United States. Over the last three decades, the airport has seen its yearly passenger numbers increase from just over 9,000 in its first year, to a forecasted 725,000 passengers in its 30th. It deals with an average of 150 flights per week. “This airport is a little gem in the west and can do so much more,” says John McCarthy, head of operations, in the documentary. Passengers passing through include the Mayo GAA team, nuns, and even VIPs. We also get to revisit the story of Marie and Michael, who reconnected through Facebook after their break-up 20 years ago. They are seen reuniting after decades apart at the airport. The documentary looks at everything from customer services to airport operations, and right up to the kitchen where the infamous ‘Knock Special’ is prepared. It also looks at the various passengers who pass through the building. The series also follows Jim Corry, the airport’s head of technical operations since it opened in 1986, as well as McCarthy as he oversees the preparations for a celebration of 30 years in the business. Also featuring in the documentary are Anne Hardman and the rest of the customer services department, whose “friendliness and camaraderie is the life blood of Knock Airport”, say the documentary makers. The marketing department’s Donal Healy and Audrey Elliot are shown devising ways to highlight the new route to Edinburgh from the airport, while also planning to welcome the airport’s 10 millionth passenger. In addition, the airport’s chief of security Pearse Concannon is shown working with members of the Gardaí and Defence Forces to get ready for the arrival of their biggest VIP yet – the Vice President of the United States, Joe Biden. If you ever wondered what goes on in the control tower, the team went up there too to meet Mike Connolly and his team of air-traffic controllers. We get to see how the airport is set on ‘a foggy, boggy hill’, meaning that weather can cause some hassle for planes at times. More than 300,000 visitors from overseas visit the region annually through the airport, contributing to an annual tourism spend of €133m. There are 100 full time employees – rising to 150 (including part-time) during the busy summer season. Executive producer Jamie D’Alton of Motive Television said that with the documentary they wanted “to highlight the vast visitor numbers that the airport generates in the wider region, as well as the important role it plays in the daily lives of many local people through employment”. The Airport Up in Knock airs at 8pm on Monday 7 November on UTV Ireland. The series has been part-funded by the Broadcasting Authority of Ireland Sound and Vision Fund. 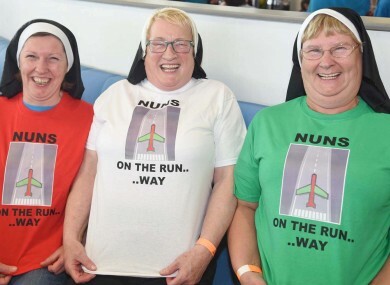 Email “Nuns, VIPs and GAA stars: Behind the scenes at Knock Airport ”. Feedback on “Nuns, VIPs and GAA stars: Behind the scenes at Knock Airport ”.